BUY PAINTINGS ONLINE BY VIJAY NYALPELLY. HIS PAINTINGS ONLINE ARE AVAILABLE ON ARTZYME.COM. VIJAY NYALPELLY IS A GRADUATE FROM SIR J.J. SCHOOL OF APPLIED ART (G.D. ART), MUMBAI. ALTHOUGH HE IS INTO ADVERTISING FIELD, HE IS FOND OF PAINTINGS. HE LOVES TO PAINT ON SPIRITUAL SUBJECTS; ESPECIALLY LORD GANESHA IS HIS KEY SOURCE OF MOTIVATION. 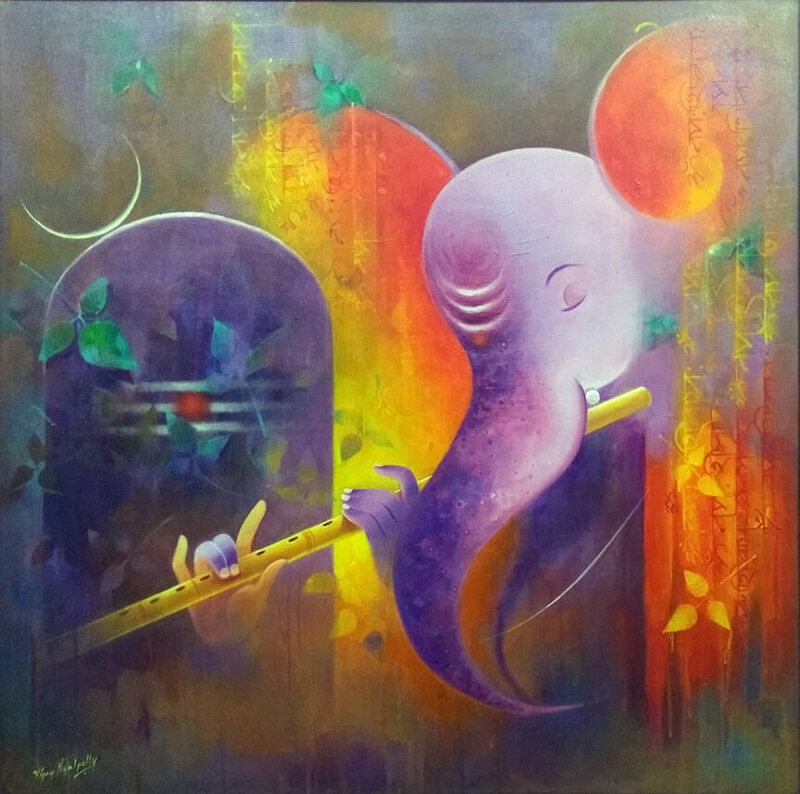 IT INSPIRES HIM TO PAINT ON LORD GANESHA AND ALSO GIVES HIM UNENDING ZEAL AND ENERGY.IN HIS SERIES, HE HAS DRAWN SOME PAINTINGS ON TOPICS WHICH ARE PRESENTED IN SEMI-REALISTIC STYLE AND FEW OF THEM ARE BASED ON ABSTRACT STYLE. HE EXPERIENCED & REALIZED WHILE PAINTING THAT LORD GANESHA IS THE ONLY MENTOR OF HIS LIFE. HE EXPLORED LORD GANESHAS INCARNATIONS UNDER DIFFERENT TITLES LIKE URJAA, KARTA, DAATA, BHAKTI, MODAKPRIYA, ASHTAVINAYAK. LORD GANESHAS STRENGTHS, LIKINGS & CONTRIBUTION HAVE BEEN EXCLUSIVELY PRESENTED THROUGH THESE PAINTINGS. THERE IS A SUITABLE COLOR BALANCE OBSERVED IN THESE PICTURES EVEN THOUGH BRIGHT COLORS HAVE BEEN USED PRIMARILY. THERE ARE FEW PAINTINGS ON LORD BUDDHA WHICH ARE DONE IN SEMI-REALISTIC STYLE. THESE PAINTINGS MAINLY TALKED ABOUT CRUX OF LIFE, STORIES, MORALS, INCIDENTS WHICH TOOK PLACED IN LORD BUDDHAS LIFE. VIJAY SAYS MY ATTEMPT IS TO ALWAYS TRY TO FOLLOW SPIRITUALITY AND CONVEY THESE THOUGHTS THROUGH MY SERIES OF PAINTINGS.